Mesa Boogie Bass 400+. 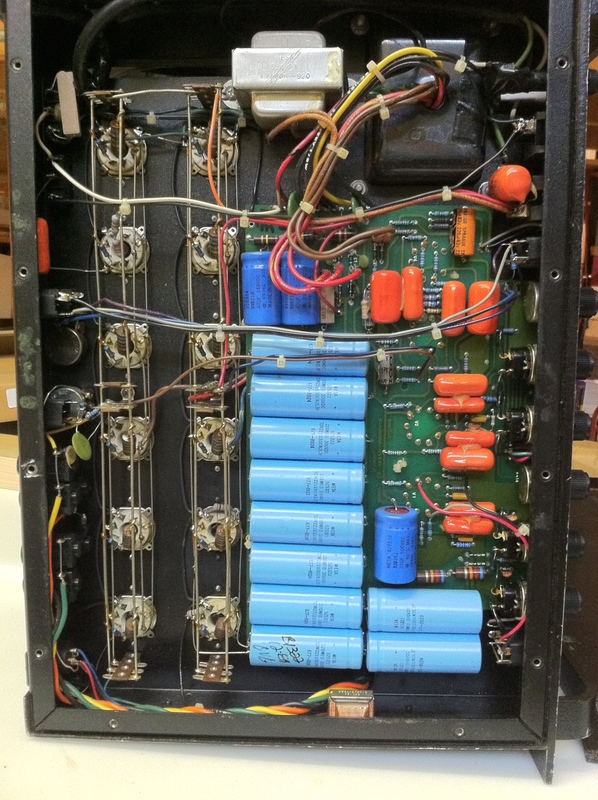 Pretty beastly amp with 12 6L6GCs in the output section, doing about 270W. There is another version of this amp with a 6.8K EQ slider, this one doesn’t have it. Old school. Basically a huge power supply and output section. 6 6L6GCs per side in parallel in push/pull. Buss wire across the whole side with screen grid and control grid resistors from buss wire to tube socket. This one had two shorted diodes in the rectifier so it would blow fuses. The fuse holder was replaced at some point and had excess wire hanging off right next to the chassis. Not sure if this actually caused the initial failure, but it was bogus. Never found a schematic for this. If you have one please share.